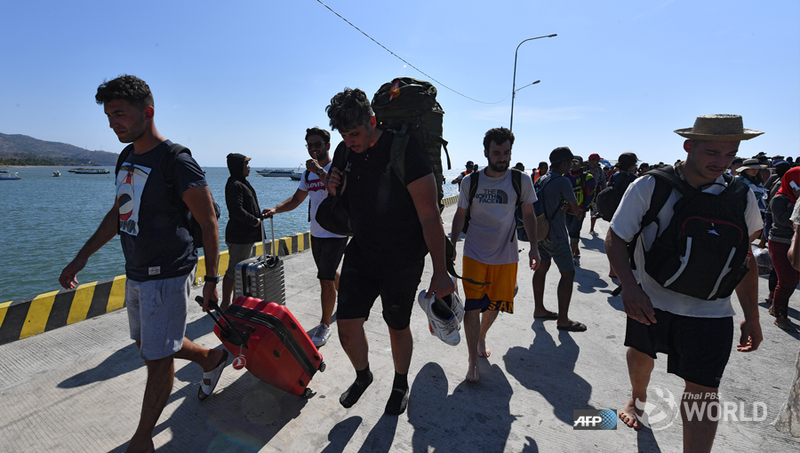 Foreign tourists disembark a boat coming from Gili Trawangan island, in Bangsal, North Lombok today, the day after a 6.9 magnitude earthquake struck the area. Rescuers used diggers and heavy machinery to clear debris and search for survivors after a magnitude 6.9 earthquake killed at least 98 people on Indonesia’s resort island of Lombok, prompting an exodus of tourists. The National Disaster Mitigation Agency (BNPB) said it expected the death toll to rise once the rubble of more than 13,000 flattened and damaged houses was cleared away after the second powerful quake in a week. Power and communications were severed in some areas, with landslides and a collapsed bridge blocking access to areas around the quake epicenter in the north – forcing rescue teams to bring in the heavy machinery. Officials said more than 2,000 people had been evacuated from the three Gili islands off the northwest coast of Lombok, where fears of another tsunami spread among tourists. Ambulances with sirens blaring raced along the coast from north Lombok, but BNPB spokesman Sutopo Purwo Nugroho said emergency units in its hospitals were overflowing and some patients were being treated in parking lots.